As office environments, workspaces and business operations change and evolve, technology needs to keep pace. Responding to this demand, Panasonic's KV-N1058X A4 network scanner delivers all the performance you need, combined with the ability to match the way you work. The KV-N1058X can be used in three 'push' scan modes, meaning they can be operated with or without a PC or USB connection. Thanks to a preset scan function, if users register their scanning requirements in advance, they can scan directly to an FTP server, SMB folder or email. We understand that your business handles documents in all shapes and sizes - and you don't want the inconvenience of having to scan each format individually. 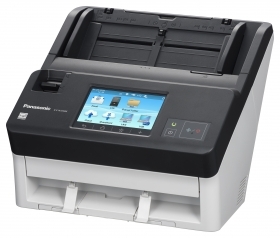 So the KV-N1058X can scan passports, embossed cards and long paper, along with mixed paper and hard card for batch scanning.